Progress can be a fickle thing. It doesn’t always happen in the situations and ways in which we’d most like to see, but it does happen. And time marches on, regardless. 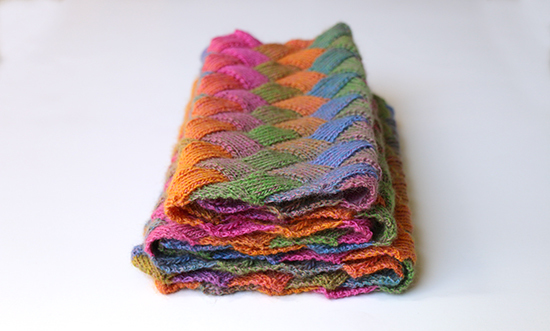 This week, I finished knitting my entrelac scarf. I started knitting the entrelac scarf just before the new year in order to use up my stash of Plymouth Yarn Zino, just over two skeins of yarn. 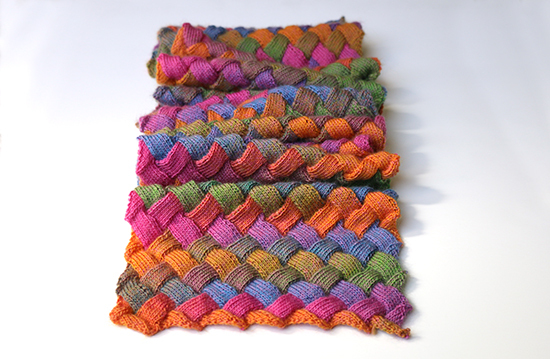 I adapted the free Entrelac Scarf pattern by Allison LoCicero to suit my gauge and the approximate width I was envisioning for the scarf. I wanted a wide scarf, but after knitting a few inches’ worth of the pattern I thought that maybe I had made it a little too wide. On top of that, I was concerned that the scarf might end up too short and need to be transformed into a cowl; narrowing the knitting would result in a longer scarf. However, the yarn is just fuzzy enough to make frogging a nightmare, so I carried on. Three months after starting the scarf, almost to the day, I finished it. Ultimately, I’m very happy with it. The cheery color changes will brighten up a cold winter day, and the scarf will look wonderful with the mittens I made from the same yarn. 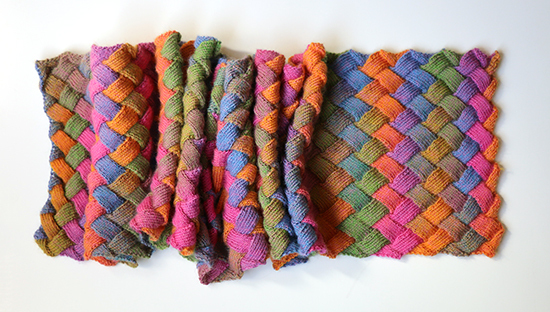 After blocking, the scarf is about 60 inches long and 10 inches wide, and I love the way the yarn bloomed and softened. The width works well. And after all that worrying, I actually think it’s too short to turn into a cowl but perfect for a scarf. Spring weather has arrived here and we’re moving to a warmer climate, which means I may not need a wool scarf for quite some time. And yet, I’m still happy to see some progress. The little steps remind me that bigger steps are coming.